Hi guys, I have to say that I have been taking a lot of time away from my blog. Thousands of apologies. Well, the truth is I was busy with few things. 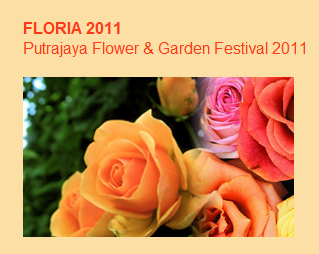 1st my car porch renovation, 2nd my book writing, 3rd the setting up of Malaysian Rose Society (MRS) since I am the founder and also was elected as the President, and 4th planning the first MRS event, that is bringing all members to FLORIA 2011. Though it would be nice to introduce this rose in July, I can't seem to wait that long. Fourth of July (FOJ) is finally in my collection and I must share this jubilation with the world. FOJ is a well-known rose, a climber (mawar memanjat) with blooms stripy white and red. Can you believe it's May already? What's good in May besides celebrating Mother's Day? Well, we got to see more roses blooming since rain is less and sun is more. Roses may bloom aplenty in May but roses are for forever, aren't they? Pink and heavily scented blooms are in the garden and they never fail to evoke a romantic feeling in me. What a delight to see petals unfurl to gorgeous blooms! Enough to make me float on air and sing in French! Let me show you how you can share your roses with others. The joy of having roses in the garden doesn't stop when the blooms age and petals fall on the ground. It is beyond these events. When blooms are spent and dead-heading begins, this is a good opportunity to save some cuttings for friends and neighbors. Green apple in the garden? A white rose (bunga ros putih) like no other! This is a white rose I personally recommend for any gardens. I wish I had grown an apple tree in my garden for its delicious fruits. But for flowers, all my nickels and dimes go to Green Apple! Know more about the habits of this remarkable rose. When I was a little girl, I saw a rose being drawn starting with a heart/love symbol as the center of the flower. Then more petals were added around it one by one forming a complete rose. Roses are always associated with love. That drawing was with no exception. There's only 2 type of Vs (visitors) in any gardens. The good ones and the bad ones. Yesterday I discovered what I think a cuckoo spit on one of my roses (pls let me know if it's not it). Bunga mawarku basah lagi! We had a thunderstorm yesterday. 5 minutes before the pour, I took the pruner and headed out to cut whatever blooms I have in the garden, especially the ones blooming full. TIP 1: These aged blooms won't last. Bring them indoors can extend their lives.